Since Oscar Zariski organized a meeting in 1954, there has been a major algebraic geometry meeting every decade: Woods Hole (1964), Arcata (1974), Bowdoin (1985), Santa Cruz (1995), and Seattle (2005). The American Mathematical Society has supported these summer institutes for over 50 years. Their proceedings volumes have been extremely influential, summarizing the state of algebraic geometry at the time and pointing to future developments. 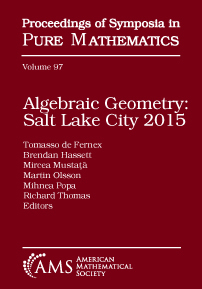 The most recent Summer Institute in Algebraic Geometry was held July 2015 at the University of Utah in Salt Lake City, sponsored by the AMS with the collaboration of the Clay Mathematics Institute. These volumes include surveys growing out of plenary lectures and seminar talks during the meeting. Some present a broad overview of their topics, while others develop a distinctive perspective on an emerging topic. Topics span both complex algebraic geometry and arithmetic questions, specifically, analytic techniques, enumerative geometry, moduli theory, derived categories, birational geometry, tropical geometry, Diophantine questions, geometric representation theory, characteristic \(p\) and \(p\)-adic tools, etc. The resulting articles will be important references in these areas for years to come. Graduate students and researchers working in algebraic geometry and its applications.